A highest standard three dimensional facelifting technique often combined with fractional C02 and Eribium Yay laser skin resurfacing and volumetric facial enhancement with fat transfer or facial implants. Facelifts are effective mainly at remove lower facial jowling, loose skin, and wrinkles. Facelifts can also provide mid-facial lifting in the cheek area (submalar). However, facelifting can not remove wrinkles around your eyes, lips, and below your nose. Also remember the effectiveness is determined by the skill of the surgeon. Q. What is a Beautify Life Lift? A highest standard three dimensional facelifting technique often combined with fractional C02 and Eribium Yay laser skin resurfacing and volumetric facial enhancement with fat transfer or facial implants. Q. What Causes Facial Aging? Many factors cause the skin to wrinkle and sag; i.e., exposure to the sun or tobacco smoke, genetics as well as the natural aging process. Children and young adults have smooth, round faces due to fatty tissue that is evenly distributed throughout the contours of the face. As you age the skin sags and fits more loosely due to two processes: 1) loss of skin strength, quality, and elasticity and 2) deflation due to fat atrophy and facial bone atrophy. As the skin sags and the underlying facial skin support diminishes, facial skin folds become prominent, especially around the chin, the jaw line and along the neck. Q. What Is A Facelift? A facelift or rhytidectomy(from Ancient Greek (rhytis) wrinkle + (ektome) excision, surgical removal of wrinkles), involves tightening of the lower facial and neck muscles as well as the removal of any excess skin. The word facelift often conjures up the impression of a complete facial metamorphosis via a very aggressive surgery. Facelifting is an invasive procedure, but it is far less invasive than other typical hospital procedures. In fact, facelifting is really skin surgery with some muscle tightening. You might think this is an odd analogy, but I feel this method of explaining what a facelift is works really well. Imagine you are in your family room looking at your carpeted floor and notice a large fold or wrinkle in middle of the carpet. The carpet ripple obviously doesn’t look good. So what would you do? Naturally, you would not want to cut the carpet ripple out and sew it back together. Why? Because you would be left with an unsightly reconstructed defect in the middle of the carpet with sewing marks, aka, a scar. The best method to fix the problem would be by elevating the carpet from the baseboard/wall and pulling the carpet ripple out and then trimming off the redundant carpet out along the baseboard. This is similar to how a facelift is performed. In a facelift, the incisions are placed along visual dissimilar anatomic transition zones in front of the ear and behind the ear in order to camouflage the incisions. Then the skin is elevated and underlying muscles are tightened. The elevated redundant skin is then trimmed to match the anatomic boundary in front of the ear and then carefully fixed in the newly elevated position by stitching. In addition, the facelift procedure is often performed in conjunction with additional cosmetic surgeries such as blepharoplasty (eyelid surgery),forehead lift,chin augmentation, liposuction and/or rhinoplasty (nasal surgery). These procedures can be performed any time after the signs of aging appear in order to attain a more youthful appearance. Q. Does a facelift treat my entire face? The term facelift is actually a misnomer. A more accurate term for a face lift would be a lower face and neck lift. Full rejuvenation of facial gravitational skin laxity would require a combination of a facelift, cheek implants, upper and lower eyelid surgery (blepharoplasty), and brow-lifting. Q. What Is the Difference Between Trademarked Quick, Swift, Lifestyle, and Weekend Facelift Procedures? Not that much. They are all variations of the mini facelift technique. The Beautify-Life LiftTM differs from other trademark facelift procedures by utilizing the full spectrum of face-lifting techniques from the macs-lift to a full facelift as determined by an individuals needs. As a metaphor, instead of using only one paint and one paint brush, Dr. Urban will utilize multiple paints and brushes in creating the best painting. * The novel aspect of the Beautify-Life LiftTM is that it attempts to improve your inner perspective of beauty by providing you with scientific-based self-help educational material in addition to an individualized facelift. *Note: Any surgeon can legally perform any of the various trademarked facelifts surgical techniques. There are no laws restricting the use of surgical techniques to the surgeons who own the trademarks. The results of facelift procedure are determined by the skill of the surgeon and not by the name of the procedure. In other words, a beautiful painting is determined by the artist and not necessarily by the brand of the paint. Q.What Is The Difference Between A Weekend facelift, Mini Facelift, Traditional (Smas) Facelift, and a Deep Facelift? Many different procedures of rhytidectomy exist. The differences are mostly the type of incision, the invasiveness and the area of the face that is treated. Each surgeon practices multiple different types of facelift surgery. At a consultation, the procedure with the best outcome is chosen for every patient. Expectations of the patient, the age, possible recovery time and areas to improve are some of the many factors taken in consideration before choosing a technique of rhytidectomy. The blue area represents the general extent of a weekend facelift. 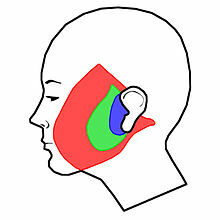 The green represents the general extent of a mini-facelift which will usually extend behind the ear. And the red area represents a full facelift with skin undermining in front of the ear and behind the ear. The weekend facelift is the least invasive type of facelift; the only difference is the omission of the neck lifting and posterior ear incision in the weekend facelift procedure. The position of the incision is usually made from the hairline around the ear with scars hidden in the natural crease of the skin. The weekend facelift was designed for younger patients usually in their 40s with mild lower facial jowling. The weekend face lift recovery is about 5 days; hence the term weekend facelift. This type of lift is a good alternative to the full facelift to people with minimal signs of skin laxity. The mini facelift with smas plication is a less invasive type of full facelift; the only difference between a full facelift is the extent of skin undermining. It is also called the S lift because of the shape of the incision that is used or the short-scar facelift. This lift is a more temporary solution to the ageing of the face which also has less downtime and is done on people who have deep naso-labial folds, sagging facial structures and mild neck skin redundancy. The position of the incision is usually made from the hairline around the ear with scars hidden in the natural crease of the skin and the posterior ear hairline. The underlying skin supporting structures (the SMAS) are then re-suspended. After this, the skin is repositioned by the surgeon with small sutures. This type of lift is a good alternative to the full facelift to people with moderate signs of skin laxity. In the traditional facelift, an incision is made in front of the ear extending up into the hairline. The incision curves around the bottom of the ear and then behind it, usually ending near the hairline on the back of the neck. After the skin incision is made, the skin is separated from the deeper tissues with a scalpel or scissors (also called undermining) over the cheeks and neck. At this point, the deeper tissues (SMAS, the fascial suspension system of the face) can be tightened with sutures, with or without removing some of the excess deeper tissues. The skin is then re-draped, and the amount of excess skin to be removed is determined by the surgeons judgment and experience. The excess skin is then removed, and the skin incisions are closed with sutures and/or staples. This type of lift is a good for patients with advanced signs of skin laxity. The technique of a SMAS facelift, consisting of mobilization, repositioning and fixating. In order to correct the deepening of the nasolabial fold more accurate, the deep plane facelift was developed. The deep plane facelift differs from the SMAS lift by freeing cheek fat and some muscles from their bone attachment. This technique has a higher risk at damaging the facial nerve. The SMAS lift is an effective procedure to reposition the platysma muscle; however the nasolabial fold is according to some surgeons better addressed by a deep plane facelift or composite facelift. Q. Am I A Good Candidate For A Facelift? If you feel your skin has lost in normal form with the formation of jowling and prominent lower facial grooves and/or folds, you are probably a candidate for a mini facelift or a full facelift. The appropriate time for facelift is really not dependent on your age but your lower facial skin aging. Based upon your evaluation, Dr. Urban will help you determine the most appropriate way to achieve your desired result. Q. When should a facelift be avoided (contraindications)? Contraindications to facelift surgery include severe medical problems, both physical and psychological. While not absolute contraindications, the risk of postoperative complications is increased in cigarette smokers and patients with hypertension and diabetes.These strong relative contraindications consist primarily of diseases predisposing to poor wound healing. Patients are typically asked to abstain from taking aspirin or other blood thinners for at least one week prior to surgery. Patients motivations and expectations are also an important factor in order to determine the patients medical status. A psychiatric illness leading to unreasonable expectations for the surgical outcome, such as a distorted perception of reality (body dysmorphic syndrome), can be a contraindication to surgery. Q. When Should I Have a Facelift? I frequently have patients ask when is the best time to have a facelift? The answer to the question is a question: Do you have jowls or excess skin below your cheeks combined with sagging neck skin? If you do, then you probably are a candidate for a facelift. A small degree of sagging can be treated with a mini facelift whereas more skin sagging often requires a full facelift. Facelifts are effective mainly at remove lower facial jowling, loose skin, and wrinkles. Facelifts can also provide mid-facial lifting in the cheek area (submalar). However, facelifting can not remove wrinkles around your eyes, lips, and below your nose. Also remember the effectiveness is determined by the skill of the surgeon. Just because your surgeon advertises that he is a board certified plastic surgeon does not guarantee your surgeon is capable of performing a safe and effective facelift. Q. How long does a Facelift Last? This is a very common question. The effects of the surgery will last forever but the facial aging clock will continue to tick after the surgery. In general the clock is turned back 10-15 years but will continue to tick after the surgery. How fast the facial aging clock will tick after the surgery is dependent upon multiple factors: facelift type, intrinsic genetic factors (your genes), and external factors such and smoking and UV radiation (sun) exposure. As it is with a lot of things in life, the mini procedures are good for a short period of time whereas the comprehensive procedures tend to last longer. Dr. Urban‘s goal is for you to not only look good but have a result that lasts. During your consult Dr. Urban will help you in the decision process of selecting the appropriate facelift procedure based upon your anatomy and your desired outcome. Remember Dr. Urban‘s number one goal is your happiness. Q. How Do I Prepare For A Facelift? We will evaluate your medical history in order to determine your overall health. Dr. Urban will discuss with you how your face can look and what you can expect from surgery. Our objective is to create a natural appearance that is pleasing to you. Photographs and computer imaging are performed to determine the amount of improvement after surgery. We will provide you with preoperative instructions that may include the elimination of specific drugs containing aspirin several weeks before surgery to minimize excess bleeding. Antibiotics may also be prescribed to prevent infection. You may be instructed to shampoo your hair the night before surgery. A small amount of hair may be shaved around your ears and temples. Wear comfortable loose clothing on the day of the surgery. You will need a responsible driver to help you home after the surgery. Do not smoke for 2 months prior to the procedure or during the healing period after the surgery. Smoking impairs blood flow necessary for wound healing. Prepare time off from work. Most people can return back to work in 1 week for a mini facelift and 2 weeks for full facelift. A Rhytidectomy can be performed under IV Sedation or general anesthesia in our state-of-the-art accredited surgical facility. These options will be discussed in detail with you. Premedication is administered for relaxation. Incisions are made inside the hairline at the temple, running in front of the ear then around the earlobe and behind the ear, ending in the hair of the scalp. The loose skin is separated from underlying tissue and is pulled up and back. Excess skin is removed. Sagging muscles and connective tissues are tightened. In some cases, fatty deposits are removed from beneath the chin and neck. Small sutures are used to close the incisions. The procedure may take up to five hours depending on whether any other procedures are performed at the same time. Q. Does my facelift need to be performed in a hospital? Today, the majority of facial cosmetic facial surgery is performed in outpatient facilities. An outpatient environment helps insure privacy and decreases the chances of hospital acquired infection. The unique aspect of Dr. Urban‘s practice is that it is one of the few offices in the state of Utah to have achieved Joint Commission accreditation. Joint Commission accreditation indicates that the office base surgery center is following the highest standards of healthcare quality and safety. Out of all the healthcare evaluation organizations, Joint Commission accreditation is consider the most rigorous and prestigious. For example, all of the nations top hospitals are accredited by Joint Commission. Utah Facial Surgical Arts surgical center is set up in the same manner as a hospitals in terms of anesthesia, surgical equipment, emergency equipment, back up power, and patient monitoring. Q. What Happens After A Facelift? Bandages applied to the area of surgery and are removed within a few days. Typically, a drain is placed behind the ear which is removed 1-2 days after the surgery. Pain is moderate and controlled with oral medications. Sleeping with the head of the bed elevated at 30% will help in minimizing swelling. Application of cold compresses for the first 48 hours after surgery will also help in decreasing swelling. You will need to avoid cigarettes and second hand smoke for 2-4 weeks. Tobacco smoke contains nicotine which narrows the diameter of blood vessels (vasoconstriction). Poor blood supply to the facelift flaps can result in localized skin death (necrosis) and scaring. Your sutures are removed within the first 5 to 10 days. In order to minimize scarring, the doctor may remove the sutures and in stages. Scarring fades quickly. Swelling and discoloration decrease within two weeks. Tightness in your face will be present for several weeks and there may be slight changes in your hair pattern around the incision. It is recommended that you avoid the sun for several weeks after surgery. Healing is gradual so you will not notice final results for up to 6 months. Improvement varies, depending on your initial condition. In most cases, a single procedure achieves the desired results. Q. How soon can I return to work? More often than not, most facelift patients feel great the day after their facelift procedure. However, just because you feel great doesn’t mean you are free from healing process. Typically there will be some swelling and some bruising. However, most patients will feel well enough to return to work in 1 to 2 weeks. If you have a wedding to attend, 4 weeks of healing would be ideal. Q. What financial options are available? As with all surgical procedures, there are some associated risks. Complications include bleeding under the skin, skin infection, less than ideal scaring, nerve injury, and localized hair loss, numbness, tissue loss, and scarring. Fortunately, serious complications with facelift procedures are rare. Dr. Urban will discuss these associated risks with you prior to your procedure. Again, Dr. Urban will do everything within his means to help insure you have a wonderful result. Notice that the result are natural looking without the overdone plastic surgery look! These are real results! Real people, just like you! Dr. Urban is dual board certified and fellowship trained in all facelift variations. If you’re interested in having aBeautify-Life Lift or another procedure, please call our office and well schedule your $100 value personal complimentary consultation today! During your complimentary consultation, Dr. Urban will listen to your treatment goals and discuss with you all of the various non-surgical and surgical options including advantages, disadvantages, benefits, risks, preoperative care, and postoperative care. There is no pressure to select a treatment. We only want you to be happy with your decision and your results.is really not dependent on your age but on your lower facial skin aging. Based upon your evaluation, Dr. Urban will help you determine the most appropriate way to achieve your desired result. BOARD CERTIFIED FACIAL COSMETIC SURGEON!